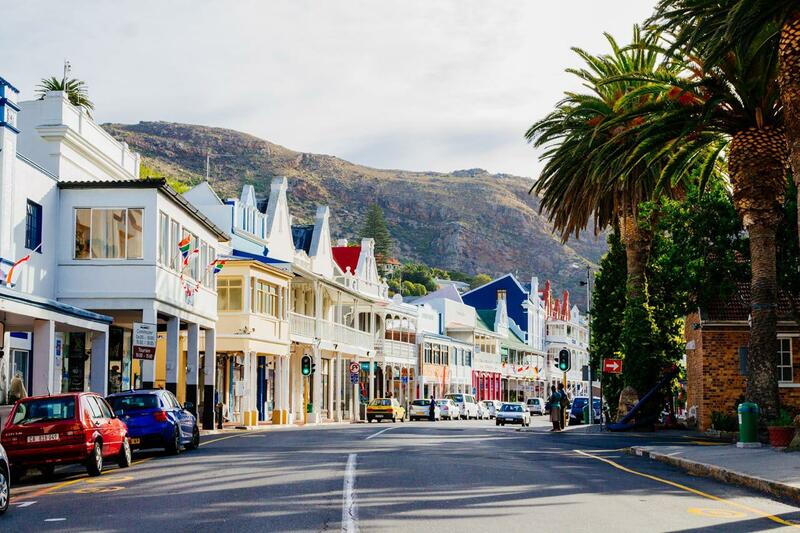 One of South Africa’s oldest towns and Naval base, Simon’s Town (sometimes misspelt as Simons Town or Simonstown) is a picturesque and historical town where many happy memories are waiting to be made just 35km outside Cape Town. From the Toy and Navy museums to the eateries and shops, here’s how you should plan your day in Simon’s Town. Start the day with a walk and a bite to eat, to prepare for the day ahead. Start the day with an audio tour to get a sense of the lay of the land. The tour starts atthe station, takes in the “historic mile”, and ends in the village centre where all activities are based. The tour is narrated by the local author Maureen Miller. At under R30 ($2), this trip is super affordable. The audio tour ends within ambling distance of two of our favourite places to grab a bite. The Sweetest Thing offers an exceptional array of mouth-watering cakes, pastries, pies and sweet treats that are proudly local. Stop by Monocle & Mermaid for a hot cup of coffee, pastries or wrap and browse their local art and music on sale while soaking up their charming décor. Visiting the African Penguin colony at Boulder’s Beach is high on everyone’s must-see list and you simply can’t leave without saying hello to our monochromatic friends. Boulders is a part of the South African National Parks and all along the penguin viewing path you’ll be able to see penguins in their natural habitat. At Foxy Beach you can also have a swim with the penguins! Once you return from Boulders, you should have some time to explore the village before lunch. Work up an appetite for lunch with Simon’s Town’s most affordable entertainment. 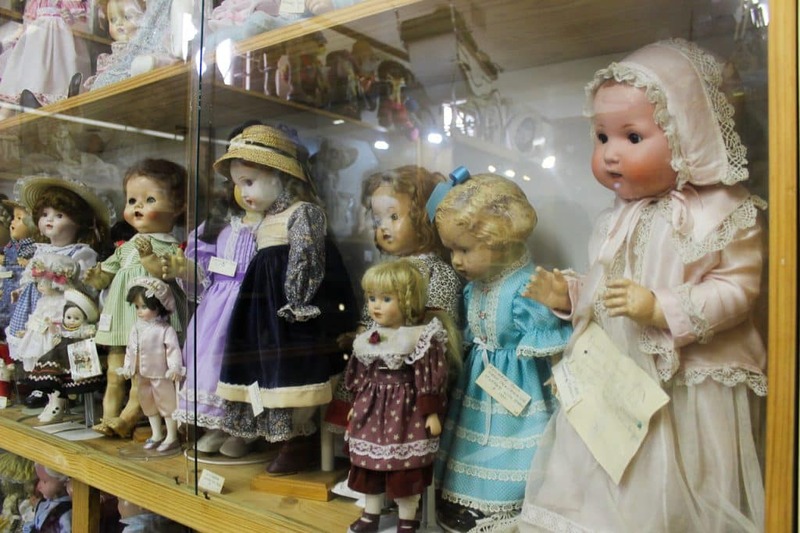 The Simon’s Town Museum, SA Naval Museum and Warrior Toy Museum have collections that will have you reminiscing. You can delve into the heart of the Muslim community’s heritage by visiting the Heritage Museum in King George’s Way. On Jubilee Square, you’ll find the statue of the Great Dane Just Nuisance who is a legend in these parts. 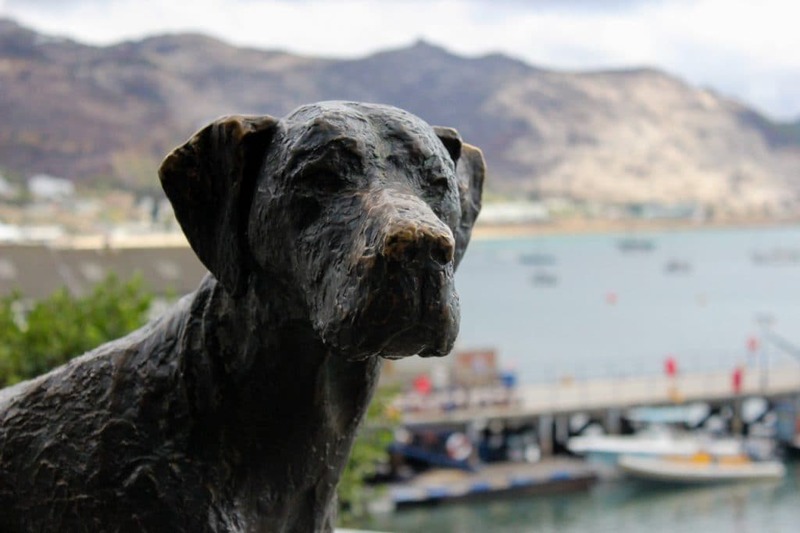 Enlisted in the 1930s, Just Nuisance is the most famous dog in Naval History. There’s also a special display for him at the Simon’s Town Museum and his grave site on Red Hill is also a frequent stop for visitors. 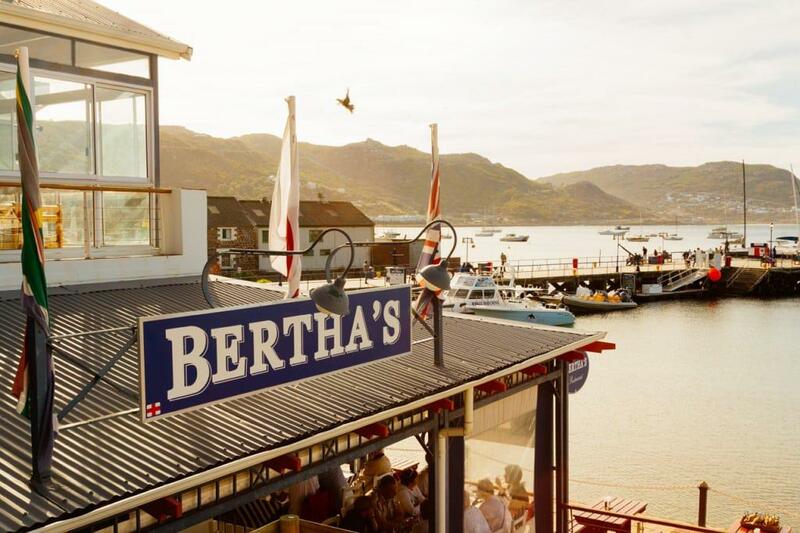 Dine on a seafood platter, oysters, prawns or the catch of the day at local favourite Bertha’s as you look out onto the harbour. For classic fish and chips, check out the Salty Sea Dog just across the way in Wharf Street If you’re heading towards Cape Point, stop over at the Black Marlin for great views and a relaxing atmosphere as you enjoy some fresh seafood. There are a few options of what to do come afternoon, depending on your interests. Here are our suggestions. 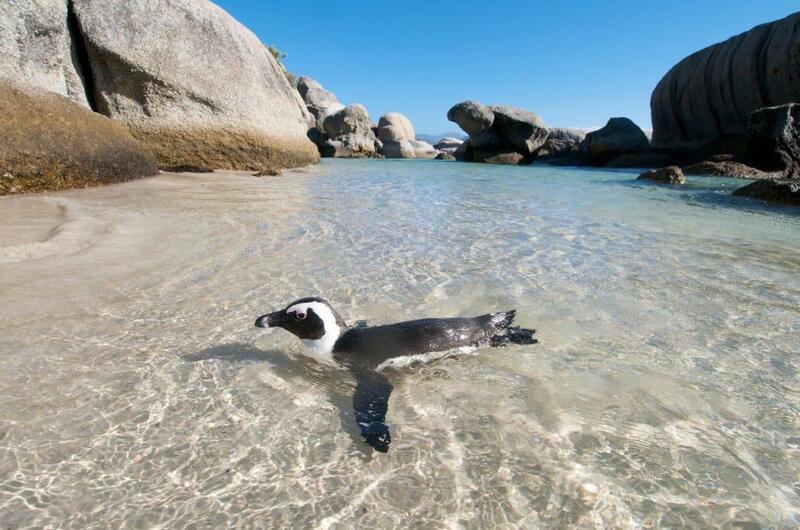 Let your arms do the work and kayak along the coastline to visit the penguins at Boulders Beach. If you’re looking to get into the water, dive with the experts of Pisces Divers and see how beautiful the waters of Simon’s Town are from below. If you want to see the famed great white shark up close in False Bay, then you’re spoilt for choice. There are many service providers who can take you on an adventure into shark-infested water, with activities ranging from cage or scuba diving to breaching and predation tours. African Shark Eco-Charters, Apex Shark Expeditions, Pisces Divers, and Shark Explorers are all accredited organisations offering a variety of shark-based activities. Read more about shark diving and see a full list of operators here. Visit the Jubilee Square for all kind of craft and souvenirs and pop by the Little Shop on the Square for more. There’s also a great selection of vintage, second-hand and charity stores along the main road, so keep your eyes and ears open for a bargain or ten. Awaken your inner sailor and head to the seas where you can go whale watching (between June and November) and appreciate the splendour of Cape Point from the ocean. A cruise to Cape Point with Simon’s Town Boat Company offers everything from whales (in season) and exploring ocean caves, to stunning cliff faces and the most spectacular view of Cape Point from offshore.